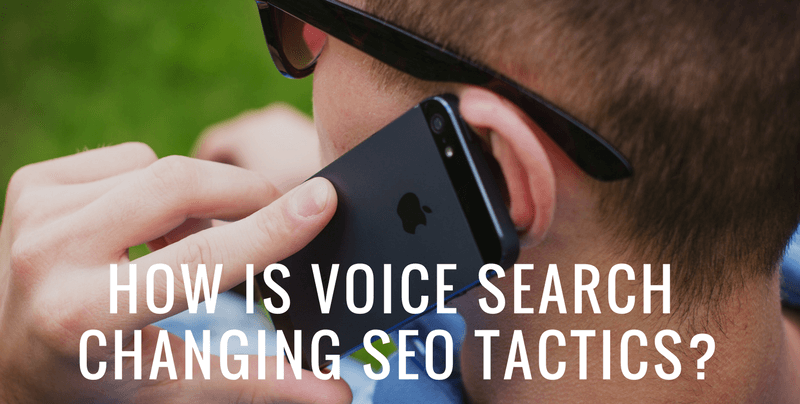 It’s interesting that we’re already discussing how Voice Search is changing SEO strategies when that became a viable option just a few years ago – and, let’s be honest, at that point we were just messing with Siri and telling our friends. The reality, though, is that Voice Search is becoming more and more popular each day! It’s projected that, in 2020, 50% of all searches will be through voice or image. And voice search isn’t just used more often, it’s also becoming more accurate. In 2014, voice searches had an error rate of 20%! Now, they’re as low as 8%. So, in an ever-changing world of online searches, what can a local business do to stay afloat? We’ve compiled a quick list of must-haves for you to follow. Pay attention to these and you will be a step above your competition. Voice search queries are much longer than typed queries. On average a typed query can be anywhere from 2 – 6 words while a voice search can easily be 7+. Both of these search types (voice and typed) are extremely important, and they are also extremely different. For a typed search, I may write something like, “Digital Marketing Company Logan UT” and look at the results. For a voice search, I may say something like, “Hey Siri, I’m looking for – what would you call it? – a firm that will help my company get more business online and stuff.” See the difference? Going off the need to focus on Long Tail Keywords, our content needs to be more conversational in general. Landing pages need to be revamped so they sound more like how a friend would explain something instead of how a textbook would explain it. This is more of a marketing point than anything else. Searchers, unless they’re already extremely educated, won’t be searching for specific offerings. Most likely, they’ll search for the most generic version of what you offer. So, let’s say you’re a Car Wash, but you call your service Squeaky Clean Hydro Wash. Unless people living in the area know your business and have cleaned their car at your establishment in the past, they won’t be searching “Squeaky Clean Hydro Wash Hours”. They’ll probably be searching “Car Wash near me”, “best car wash in ___” or (if it’s a voice search) something like, “Hey Siri, where’s the best place to get my car washed around here?” Take a few minutes to brainstorm through as many search variations as you can, and then build your landing pages’ written copy around that. Including long tail keywords and focusing on more conversational text in your copy will help Google better understand what that page is about, give searchers more relevant information they need, help your website rank better, lead to a better click-through-rate, result in higher conversions, and more. It’s a win-win-win. The key takeaway is that, obviously, your website’s mobile-friendliness is important. Often it’s more important than we realize. One mistake that many businesses have is focusing on making mobile-friendly content up front, and then assuming what they’ve done is enough. Click here to test how mobile-friendly your website really is. Get that Google My Business Listing Verified and Optimized! Honestly, this shouldn’t be news. It’s almost 2018 and Google My Business has been around for a while. It’s the avenue through which businesses rank in the Local Pack (first few Google Local results). Take a second real quick to go through your Google My Business listing. Double check the details and make sure they’re up to date. Also, make sure you have a unique description, choose correct categories and add lots of pictures. The information here should reflect what’s on your website. Next, focus on reviews. The number of reviews your Google My Business listing has is critical if you want to rank in the first few local results. So, the more reviews you have, the better. Just make sure you refrain from incentivized reviews, though. In a Moz article, it was explained that there is a huge rise in what’s referred to as “instant answers”. There is also a rise in the capabilities of Search Engines. Nowadays, Google can immediately show you currency conversions, sports scores, the cast of the newest movie, etc. So, you’ll want to shy away from those things Google can already answer and instead focus on things that are not easily answered in just a few words. Instead of cooking conversions and sports scores, you may focus on recipes and sports analysis. This is because, often, users will see the initial information they needed and then click through to that website and read on. Going along with this, that’s why FAQs pages are becoming very popular because it allows searchers to instantly find the information they need about a business. Remember, while voice searches continue to rise (in some statistics, voice searches will be over 60% in the near future), that doesn’t mean it’s taking over typed search. The truth is typed search is increasing as well, just at a slower rate. So, rather than only focusing on voice searches, we should view this as additive and implement both focuses in our Digital Marketing strategies. It wouldn’t be fair to write an article about SEO tactics and forget about what Google’s looking for. As content becomes more conversational in nature, it can become harder for Google to understand what the content on your pages is about. That’s why providing context with Schema Markup and optimizing your website’s Structured Data is so important (click here to make sure you’re including proper Schema Markup for a local business). Including both of these in your SEO strategy will benefit Google and your future customer. For those who are familiar with SEO (Search Engine Optimization), you’ve heard the dreaded term “Google Algorithm Update”. It can turn new websites into overnight-winners and send established websites to the awful 10th+ page of search results. Always keep in mind how often technology is changing. Search assistants like Siri, Cortana and Google Assistant go way beyond a simple search. They can help complete tasks like setting alarms and reminding you to call someone. If you’re having trouble wrapping your mind around all of this, feel free to reach out to us! We love what we do and will gladly help you develop a Digital Marketing strategy that will keep up with the guaranteed innovations in search technology.